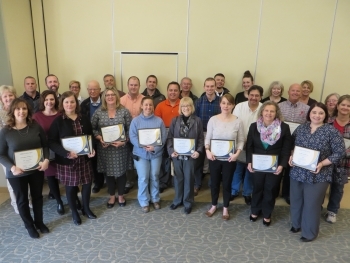 100% Award: Presented to each company that has zero injuries or illnesses resulting in a day or more away from work in the previous calendar year. Group Award: Presented to the company with the lowest incident rate in each group. For this award, the groups are divided by manufacturing with less than 100 employees, manufacturing with more than 100 employees; construction, healthcare, service industries, and government. Achievement Award: Presented to each employer that decreases its incident rate by at least 25% from the previous year. Special Award: Presented to each company that accumulates at least 500,000 hours and at least six months without a lost-time injury or illness.